Not so long ago, songs by the Andrews Sisters and Lawrence Welk blasted from phonographs, lilted over the radio, and dazzled television viewers across the country. Lending star quality to the ethnic music of Poles, Italians, Slovaks, Jews, and Scandinavians, luminaries like Frankie Yankovic, the Polka King, and "Whoopee John" Wilfart became household names to millions of Americans. In this vivid and engaging book, Victor Greene uncovers a wonderful corner of American social history as he traces the popularization of old-time ethnic music from the turn of the century to the 1960s. Drawing on newspaper clippings, private collections, ethnic societies, photographs, recordings, and interviews with musicians and promoters, Greene chronicles the emergence of a new mass culture that drew heavily on the vivid color, music, and dance of ethnic communities. In this story of American ethnic music, with its countless entertainers performing never-forgotten tunes in hundreds of small cities around the country, Greene revises our notion of how many Americans experienced cultural life. 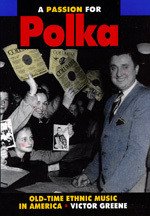 In the polka belt, extending from Connecticut to Nebraska and from Texas up to Minnesota and the Dakotas, not only were polkas, laendlers, schottisches, and waltzes a musical passion, but they shone a scintillating new light on the American cultural landscape. Greene follows the fortunes of groups like the Gold Chain Bohemians, illuminating the development of an important segment of American popular music that fed the craze for international dance music. And even though old-time music declined in the 1960s, overtaken by rock and roll, a new Grammy for the polka was initiated in 1986. In its ebullience and vitality, the genre endures. Victor Greene is Professor of History at the University of Wisconsin, Milwaukee, and the author of American Immigrant Leaders,1880-1920: Marginality and Identity (1987) and For God and Country: The Rise of Polish and Lithuanian Ethnic Consciousness in America (1975).